Pete had always participated in school choirs, musicals, and the local karaoke circuit, but it was prompting from family and friends that enticed Schlegel to start a band. With his popularity on the rise and the riggers of touring, Pete would have to choose between his normal life as an ex-Ohio State Trooper and EMS helicopter pilot, and his childhood dream. It didn’t take Pete long to decide. In March 2002, Pete headed to Nashville, where he began working with producer Clyde Brooks. Brooks produced Pete's first album "Strong Stuff". A total of three nationally charted singles were released from "Strong Stuff". The singles "Short For Gone", "Leavin' Ain't As Easy As It Sounds" and "It takes a Whole Lot Of Liquor To Like Her" have exposed Pete to a wider audience in the United States as well as Europe. "Leavin' Ain't As Easy As It Sounds" dominated the international chart for over seven weeks and became the Number 1 single in Germany. That #1 chart position currently hangs in Schlegel's house, as the song’s position on the international chart stands above country superstar staples like Tanya Tucker, Travis Tritt, and Kenny Chesney. The "It Takes A Whole Lot Od Liquor To Like Her" video was chosen as a Hot Pick Video on Great American Country (GAC) television and received substantial video spins on VH1 Country. 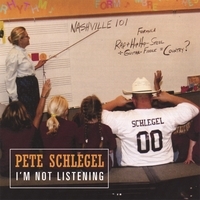 Pete Schlegel’s music isn't easily tagged, but a guitar-driven, up-tempo, honky-tonk sound describes it best. Reminiscent of his inspirations, Ernest Tubb, George Jones, and Brooks and Dunn, Schlegel’s sound is timeless. Schlegel’s vocals are delivered just the way they’re written: genuinely. No pretension or glossy over production, just the range of human emotions and experience of one man. Schlegel’s endearing and approachable personality makes for songs that every woman wishes her man could sing to her. Pete has just completed his sophomore project "I'm Not Listening" under the direction of Nashville producer Ted Hewitt. The first single and video release "You Can't Bring Her Back" will be released to radio and video outlets in early 2006. In 2006, deemed as the “Double S” tour, Pete has joined forces with Daryle Singletary to tour in support of their new albums releases. Pete Schlegel is paving the "grime and sweat" road to fame. Once Schlegel is there, under the neon lights of stardom, it's not likely he’ll forget what’s most important. “We're building a fan base, if you don't forget where you came from, your fans will never forget you”. Great and real Honky Tonk Music,Pete has great Voice and Hope next Cds will come with most of the traditional Honky Tonk. Thanks. Jorge Muro Chihuahua, Mexico.